Hi, Everyone today my blog is celebrating its 6th Anniversary. In this occasion, I thank each and every one from bottom of my heart for your support and valuable comments. I except the same from all of you in coming year’s.Today I made a chocolate cake with chocolate ganache frosting. It is a very big hit in my home, half of the cake was finished in 10 minutes. Here goes the recipe. 1.Preheat the oven to 180C/350F/Gas 4. Grease and line 8inch cake tin. 2. Take a bowl, sift flour, cocoa powder, baking powder and baking soda. Then add sugar to it and mix everything well. Add eggs, milk, oil and vanilla extract and using an electric whisk, beat the mixture until smooth and well combined. 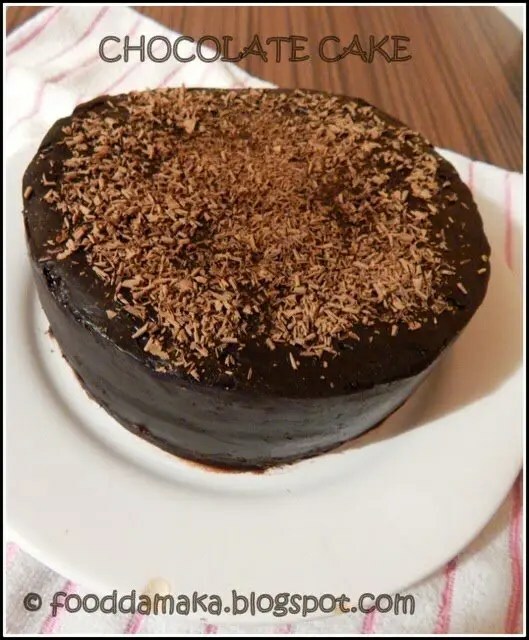 4.pour the mixture into the greased tin and bake in the oven for 25-40 minutes, or until the top is firm to the touch and a skewer inserted into the center of the cake comes out clean. Remove the cakes from the oven and allow to cool completely, before icing. Heat the chocolate and double cream in a microwave-safe bowl for 30sec-1minute, until the chocolate melts. Remove the bowl and whisk the mixture until smooth, glossy and thickened. Set aside to cool. Frost the cake with the icing and enjoy! Hi, Everyone today my blog is celebrating its 6th Anniversary. In this occasion, I thank each and every one from bottom of my heart for your support and valuable comments. I except the same from all of you in coming year's.Today I made a chocolate cake with chocolate ganache frosting. It is a very big hit in my home, half of the cake was finished in 10 minutes. Here goes the recipe. Preheat the oven to 180C/350F/Gas 4. Grease and line 8inch cake tin. Take a bowl, sift flour, cocoa powder, baking powder and baking soda. Then add sugar to it and mix everything well. Add eggs, milk, oil and vanilla extract and using an electric whisk, beat the mixture until smooth and well combined. pour the mixture into the greased tin and bake in the oven for 25-40 minutes, or until the top is firm to the touch and a skewer inserted into the center of the cake comes out clean. Remove the cakes from the oven and allow to cool completely, before icing. Congrats dear….cake looks awesome n amazing..
Cake has come out so good. Congratulations Pavani! Congrats on this momentous occasion. What a way by celebrating this with this lavish. Thank you all for ur wishes and lovely comments..